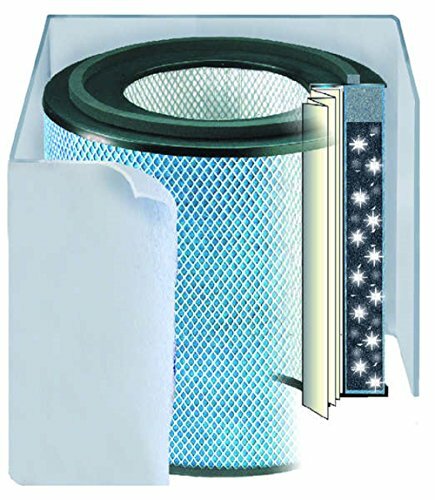 HEALTH MATE Austin Air Healthmate Air Purifier (HM400) Replacement Filter with Pre-Filter, White, Manufactured in USA! For an air cleaner to be effective, it must remove sub-micron particles, noxious gases and chemicals from the air without creating by-products such as ozone. In every Austin Air cleaner, you'll find True Medical Grade HEPA and Activated Carbon, the only trusted filter technology used in hospitals and operating rooms. Manufactured in the United States, Austin Air further minimizes its energy consumption when processing, packaging and transporting products to you. Austin Air is committed to operating within policies that lessen our carbon footprint and promote clean air for generations to come. Each Austin Air cleaner must meet stringent government and independent third-party testing standards, with tests designed to protect you by ensuring the products you buy work as claimed. Austin Air takes no shortcuts and never submits its products for private testing to guarantee a desired result. All Austin Air products are Manufactured in the USA! If you have any questions about this product by HEALTH MATE, contact us by completing and submitting the form below. If you are looking for a specif part number, please include it with your message.